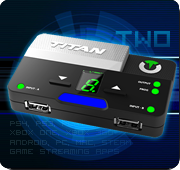 The Titan One device now supports the Nintendo Switch console. You are now free to use your favorite controller, Gamepacks and scripts on the newest console from Nintendo. This update also brings many other features such as the compatibility with the Nintendo Switch Pro controller and wireless connectivity for the Xbox One S controller (Bluetooth), along with improvements, additional controller support and bug fixes. In the HOME Menu of your Nintendo Switch select “System Settings” > “Controllers and Sensors”. Check the option “Pro Controller Wired Communication”. The Titan One firmware update 2.50 also adds support for the Nintendo Switch Pro Controller in wired mode. Use this high quality gamepad on any compatible console or system, such as PlayStation 4, Xbox One, Nintendo Switch, PlayStation 3, Xbox 360, PlayStation TV, PC, Steam, Android Devices, as well as with Xbox One Streaming App and PS4 Remote Play. 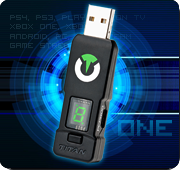 You can now enjoy your Xbox One S Controller to play wirelessly with the Titan One, Gamepacks and Scripts on any compatible console or system, including the Nintendo Switch. The controller vibration, force feedback on the triggers and the guide button are supported and working as expected.